The Stormont Assembly will convene later today in for a special session designed to clear the way for power over welfare reform to be handed to London. DUP Social Development Minister Mervyn Storey will put a legislative consent motion before MLAs that effectively transfers powers over welfare reform from the Assembly to the British government, paving the way for cuts to benefits. DUP and Sinn Féin support for the motion means that it will be passed, but the position of the SDLP, the UUP and Alliance will become clearer as they take to their feet to speak on the new deal hammered out between the two main parties and the British and Irish governments. In the first test of his leadership qualities, new SDLP boss Colum Eastwood will signal whether he’s in favour of a move towards opposition-style politics, or whether he’s willing effectively to reinstate the status quo after a 10-week crisis that threatened to bring down the institutions. “The SDLP will assess and interrogate the DUP/Sinn Féin proposals,” he said. “We will not rush to judgment but our judgement will be clear and certain. The SDLP and the Alliance Party were given less than 60 minutes to read a DUP/Sinn Féin document over 60 pages long. We were then expected to enter an Executive meeting and sign up. That is no way to get an all-party agreement. “The absence of comprehensive proposals on the past is a very serious failure. Three times before – Eames Bradley, Haass O’Sullivan and Stormont House – negotiations to address the past did not succeed. Now for a fourth time, victims and survivors will be deeply disappointed. This cannot be allowed to endure. We must get back to this work. Those who persist in impeding truth and accountability cannot prevail. “At best this deal saves devolution from collapse, but Alliance is sceptical it will place the institutions on a sustainable basis, never mind offer a fresh start,” he said. “Unlike some others, Alliance played a constructive role throughout this process, and some of our proposals are reflected in the final document. But this deal is far from the comprehensive outcome promised. At this stage none of the main issues from the Haass talks of 2013 have been resolved: mere promises of actions on flags and parades and nothing on the past. Alliance proposed an adjournment until next week, to allow proper scrutiny of what should be major government decisions that have potentially deep, long-term implications. Surprisingly, UUP leader Mike Nesbitt – who was heavily criticised by other parties for what they saw as obstructive UUP tactics during the long talks process – was the only talks delegation leader not to comment on the agreement yesterday. Instead the UUP – which has already declared its intention to move towards opposition politics – issued this boilerplate, unsigned statement on its website. “We received the document late this afternoon and it is only fair that we give it careful consideration. We have already identified a number of questions for which we will be seeking answers and there remain a number of outstanding issues. 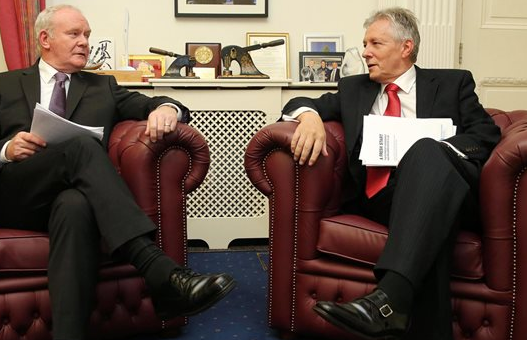 First Minister and deputy First Minister Peter Robinson and Martin McGuinness showed a surprisingly united and harmonious face to the world after lengthy period of bitter recriminations and accusations. Mr Robinson said: “Both the deputy First Minister and I are pledged to work together to implement the vision contained within the Agreement. While coming from different political backgrounds with different political outlooks we are both united in our determination to forge a better, more prosperous future for everyone in Northern Ireland. “At the outset of this process I indicated that we needed to make Stormont fit for purpose and to secure an agreement that would deliver a stable and long-term basis upon which to operate. I believe we have secured that outcome. For the first time this agreement commits all parties to call for and work together to achieve the disbandment of all paramilitary organisations and their structures and to accept no authority, direction or control on our political activities other than our democratic mandate alongside our own personal and party judgement. These and other commitments will be added to the Pledge of Office as a requirement of a person taking Ministerial office. “In addition to further commitments from the parties there will be a new and concerted effort to tackle criminality and organised crime. A new joint agency taskforce will be established and resourced with the aim of putting those still involved in terror and criminality out of business once and for all. “Our agreement contains details of the steps we will take as an Executive, as well as those to be taken by the UK government, on welfare reform and sets out measures to support those working people who may suffer from a reduction in tax credits. The UK Government will pass a Northern Ireland Welfare Bill at Westminster following a debate in the Assembly tomorrow. Mr McGuinness said: “At the heart of this agreement is our common commitment to a better future. The cuts to our welfare budgets, tax credits and our block grant are wrong and unfair. We are determined to do all in our power to oppose this austerity and protect our people and our public services. “We have secured more than half a billion pounds of additional funding for the Executive plus flexibilities that can be invested in growth and public services. We are providing a package of £585 million to support the most vulnerable in our society and low-income working families. “We have appointed a panel under the leadership of Professor Eileen Evason to draft proposals on how this money will provide essential support to people on welfare and thousands of families targeted by Tory cuts to tax credits. We will continue to do all we can to support those in need. “The legacy of the past remains a huge gap in this work. The onus remains on the British government to live up to their responsibilities to victims, in particular full disclosure. We also addressed directly the issue of paramilitarism. There can be no place for armed groups in our society. That is why the agreement includes additional resources for policing and mechanisms to challenge armed gangs and criminality. “There are questions around the finances. We will need to reconcile the various references to additional monies. There are also some glaring omissions. We are very disappointed that victims’ hopes have been built up, only to be let down again.